CONDITIONS OF SALE: The painting has to be on permanent exhibition and free of charge at least six months every year, until unification of North Korea and South Korea. It also has to be offered to South Korea every year for six months, should they wish to borrow it for a free display. STORY: The unresolved conflict between South Korea and North Korea is, like many others around the world, a result of competing interests of large powers. Small nations are used as toys. 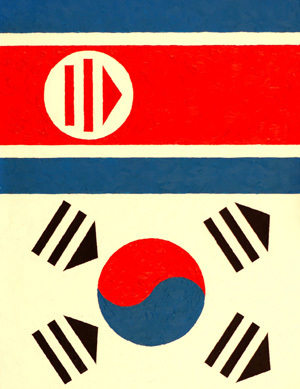 In this AbFab painting flags of North Korea and South Korea are positioned in their respective geographic positions. However, they are also modified. The red pentagram of the North Korean flag and four black trigrams of the South Korean flag are replaced with a "play/pause" sign, often found on remote controls for different electronic entertainment devices. Paint is applied straight from the tube and very roughly, suggesting that these are rough games. The price is a rough estimate of the total population of these two counties, and preferred buyer is selected to suggest that there are no free gifts.